As consumers are set to spend more than €100m online this Black Friday and Cyber Monday our latest dot ie Digital Health Index has found that only 28% of Irish SMEs can process payments on their website. This is despite Ireland’s €9 billion e-commerce market and predicted €100m online spend between Black Friday and Cyber Monday*. We also found that 86% of Irish consumers plan to spend online this Christmas and 85% would prefer to buy Irish. Despite this 22% of Irish SMEs have no online presence whatsoever—neither a website nor a social media presence and 1 in 6 SMEs, or 17%, say they are offline because of poor broadband. The research shows that just 32% of SMEs can take sales orders on their websites while only 28% can process payments and 35% can accept bookings or reservations on their websites. These numbers have increased slightly since the last dot ie Digital Health Index report in April 2016, however they suggest that Irish SMEs are still not tapping into the growing Irish e-commerce market valued at €9 billion this year. Despite their lack of e-commerce ability, 81% of SMEs say that their website is important or very important for driving future sales growth; 77% as a driver of generating sales; and 57% as a point of transaction to capture and process sales. Our consumer research revealed an increasing willingness to spend online. Consumers reported that their online spend has increased by 41% over the last two years. 86% plan to spend online over the Christmas period; 85% would prefer to spend on an Irish website. However, Irish SMEs’ low engagement in e-commerce makes this difficult. The overall dot ie Digital Health Index score fell for the first time since research began in May 2014, to 41.76, the second lowest score. In many cases, SMEs are using fewer digital assets, like websites and social media. The report revealed that 1 in 5 or 22% of SMEs have no online presence whatsoever. 38% say that a lack of time is keeping them offline and 28% a lack of expertise; 27% cite financial constraints and 16% are concerned about cybersecurity. 1 in 6 offline SMEs, or 17%, say a poor internet connection is preventing them going online. Surprisingly, a massive two thirds, 66%, of offline SMEs say they do not intend to build a website in the future, primarily because they see “no need” in their industry. Despite anecdotal evidence suggesting that SMEs have a negative or costly experience building websites, the research found that of those who used a professional developer, 84% rated their developer’s professionalism as ‘good’ or ‘excellent’. – 72% of SMEs report a positive impact from social media; of that figure, 97% said it had increased awareness of their business and 81% said it had increased (offline) sales. – The average SME spends 25 minutes each day on its social media pages, meaning more time spent interacting with customers and promoting their business. Commenting on the dot ie Digital Health Index’s findings, David Curtin, our Chief Executive, said: “It is alarming that in 2016, only one third of SMEs can sell or take payments online. The failure to properly tap into the growing €9 billion online market may have long-term consequences for Ireland’s economy, particularly for rural communities given their significant dependence on SMEs. “If consumers build a relationship with British online SMEs, the business may be irretrievable for Irish SMEs. This issue will be exacerbated by Brexit, with Irish consumers migrating to sterling-based websites and travelling across the border for a better shopping experience. “As consumers, we are spending more on the internet than ever before, yet our own businesses just aren’t there to serve customers. With Christmas less than a month away, and an appetite among Irish consumers to spend locally, SMEs are missing out on new customers. 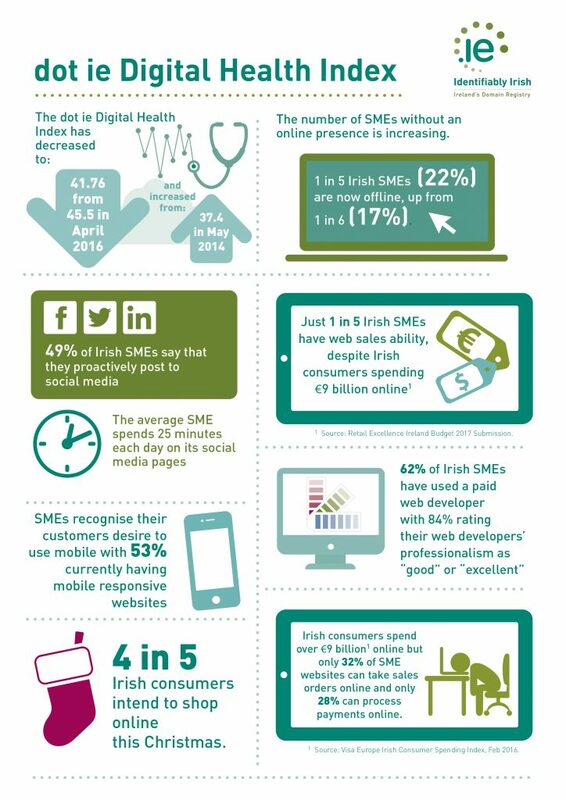 “1 in 5 Irish SMEs have no online presence whatsoever. Unsurprisingly, the biggest barrier to SMEs getting online is a ‘lack of time’ and ‘lack of finance’. This is a shame, however, because these problems can be easily addressed; there are plenty of inexpensive, easy-to-use tools that put together websites with basic e-commerce functionality in a few hours or less. “However, there are infrastructural deficiencies and business support issues that can only be properly fixed through collaboration between industry and government, particularly broadband availability. Funding also needs to be directed to Local Enterprise Offices and Chambers of Commerce in rural areas to support entrepreneurs making the leap online. Click here to view the complete report and please contact us if you would like a hard copy.